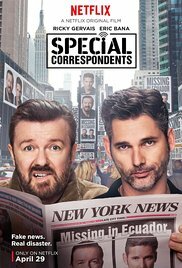 Suave and slightly unethical radio news reporter, Frank Bonneville (Eric Bana) and his sound engineer, Ian Finch (Ricky Gervais) are supposed to go to Ecuador to cover a war there, but unforeseen circumstances lead them to pretend to be reporting on the war in Ecuador while across the street from the station upstairs over a restaurant. Frank Bonneville is a radio newsman in New York who doesn't exactly play by the rules. He has a big ego, is super slick, a womanizer and a bit shady about how he gets his stories, which is kind of funny right there because who is doing radio journalism anymore? How can you really get a big ego from doing that? Anyway, his boss has it out for him because he embellishes his stories and says if he screws up one more time, he's out. Ian Finch is a mousy sound engineer who is conscientious and married to Eleanor (Vera Farmiga). Eleanor isn't that happy with Ian (she thinks he's a loser because he plays video games and collects action heroes - actually he kind of is), and when she meets Frank at a radio station event, she fails to tell him she is married and they hop into bed together. Meanwhile, a war has broken out in Ecuador, (Ecuador? A war? Really?) and Frank is given the assignment and told to take Ian with him. Frank is also told by his boss to not screw up. But Ian inadvertently throws the tickets and passports into a garbage truck (long story) and the two must figure out what to do. Since the war would probably be over by the time they were able to get new passports and this would constitute screwing up, thus losing Frank his job, they concoct a plan. They will stay in New York and PRETEND to be in Ecuador reporting on the war. And how will they do that? Welcome to the mind of Ricky Gervais who directed and stars in this remake of a French film that he adapted. Ian has befriended a South American couple, Domingo and Brigida (Raul Castillo and America Ferrera) who own the restaurant across the street from the radio station. Ian shares their idea with them and they offer Frank and Ian a room above their restaurant. Ian sets up his equipment complete with jungle sounds and Domingo and Brigida provide Spanish language crowd noises to create an Ecuadorian atmosphere. Ian and Frank actually pull this off. Ian isn't a loser after all. He is able to create a war-torn Ecuador in an apartment above a restaurant across from the radio station. But then Frank decides to take it all to another level. As he sends in his reports they get more and more colorful. He creates a false story. He invents a "man" who is working for the government who is funding the war. That story is picked up not only by the other news agencies but by the State Department. The fake story goes viral and as the story is passed around it becomes bigger and bigger news. Now Frank's boss tells him they needs to report to the Embassy in Quito. Because they can't do that - they are in an apartment over a restaurant across the street from the station- they go even further and say they have been taken hostage. If they are hostages, they can't very well report to the U.S. Embassy in Quito, right? Ian's wife, Eleanor, who always wanted something more for herself finally gets the chance she has been waiting for. She goes on TV to beg for Ian's release. She has written a song about donating a dollar for the hostages and money comes flying into her. So now she is not only famous as a wife of a hostage, she is rich. When Frank sees her, he realizes she is Ian's wife. Uh-oh. As they get themselves in deeper and deeper, they realize they somehow have to get to Ecuador if they are going to pull this off. They hop a boat and guess what? As soon as they arrive in Ecuador, they are taken hostage - FOR REAL! Ricky Gervais is a comedian and for some an acquired taste. His comedy is edgy and often "out there." He made his name writing and starring in the original version of "The Office" in the UK and creating the character of David Brent. He went on to write and star in the HBO series "Extras,"and "Life's Too Short" and "Derek" on Netflix, but most Americans probably know him for his hosting of the Golden Globes, where he is known to be quite outrageous and totally doesn't care who he offends. I think he is hilarious because his humor is fearless. He fears nothing and no one. But when you are that kind of comedian, your humor can sometimes be hit and miss. That's what this film is like. The concept is funny. Many of the situations and scenes are funny...and some aren't. However, Gervais is also attuned to the politics and culture of the day and this film is a bit of a commentary on the media and how easy it is to put untrue stories out there and have us all believe it. I just wish the film had been funnier. But the revelations here are Eric Bana and Vera Farmiga. We knew Ricky Gervais was funny, but Eric Bana? We are used to him in serious roles. Vera Farmiga? We are used to her in more sensitive roles. Ricky actually plays straight to Eric in many scenes and Vera is just downright hilarious as the morally corrupt Eleanor. This film was a Netflix exclusive and was available for streaming April 29th. More and more, we will be seeing films released exclusively on Netflix, Amazon, HBO and others, and the actors will be out there on talk shows hyping the films just as if they were going to be released in the theaters, except they are actually released directly into our living rooms.. And this film is one of those. Rosy the Reviewer says...it's a silly little romp with great performances by Gervais, Bana and Farmiga, and you can watch it right from the comfort of your own living room.! It's been 30 years since the defeat of the evil Galactic Empire but as these things go, there is another evil force at work: The New Order. And now we have to start all over again to get rid of these new guys. You might have been wondering when I was going to get around to this one. Well, since this broke box office records, you probably didn't miss it when it first came out in the theatres like I did. By now my review is a bit anticlimactic, I know. I tried to go when it first came out, waiting for what I thought was an appropriate amount of time so that the crowds would have dissappated and attending at an unfashionable time like Tuesday afternoon at 2pm. But no, it was sold out. So it just wasn't in my cards to see this in the theatre, but I wish I had because I am hoping it was better there. And it's probably futile to even review it at this point. 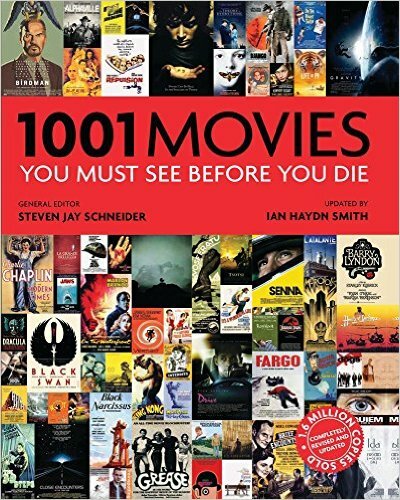 If you are a big Star Wars fan, you have most likely already seen it, and if not, then nothing I am going to say will probably influence you. First, you know how I feel about sequels. But since the entire "Star Wars" franchise is made up of sequels, I can't really criticize it for that, except to say, the main problem with these movies that go on and on and on and try to keep a story going is that if they take years to make and get released, the audience forgets what happened in the last one. That was a main criticism of mine with the last "Hunger Games" installment. If you are like me, here is what I would recommend: Before seeing this film, watch all six that preceded it and then see this one. I think that's the only way it will make sense. I didn't really know what was going on half the time. 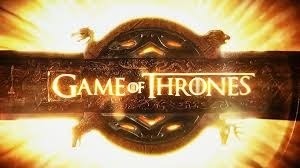 If a sequel is not going to stand alone in its storyline, then some effort needs to be made to bring us all up to date. They didn't. However, this latest (and no doubt not the last) installment in the "Star Wars" story does give homage to the original. Luke Skywalker is the last of the Jedis and is almost mythical. The New Order is the name of the bad guys, but they still look just like the Storm Troopers of old. Oscar Isaac is the leader of The Resistance and everyone is trying to find Luke. 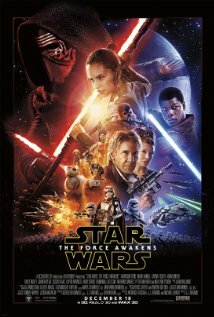 The star is newcomer Daisy Ridley as Rey and she does a good job as the spunky female lead. I don't think there is any need for me to go into the plot in detail. If you are a Star Wars fan you already know it. And it's similar to everything that has gone on before so instead of that, I will just list what I liked and what I didn't. A female lead - you go, girl! It's been so long since the last "Star Wars," does anyone really care? Yes, I know everyone stormed the box office, but now that you have seen it, was it worth it? Here's a question that nags me: Apartment buildings and companies have cameras everywhere that record people coming and going, but characters seem to be able to wander around long corridors in spaceships and no one knows they are there. Why is that? Just wondering. Directed by J.J. Abrams, it's fun to see the aging stars from the original, and I am sure this isn't the end of it all. Rosy the Reviewer says...if you love "Star Wars," you probably don't care what I think, but if you enjoy these but it's been awhile, I recommend either doing some homework ahead of time or binge watch all six previous episodes so you will know what the hell is going on because they don't really give you much from the past movies. I still don't remember where Kylo Ren came from. 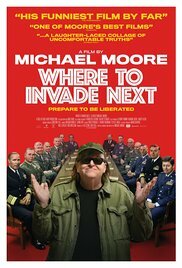 Filmmaker Michael Moore, one of our very best documentarians, "invades" other countries to see what the United States can learn from them. Since, according to Moore, the United States has not won a war outright since WW II, maybe we should stop making war and start "invading" in others ways, by learning from other countries what they are doing to solve some of their socioeconomic problems. Moore decided that he would "invade countries to bring back what we need," something no army can do. Moore interviewed Italians from different walks of life and asked them about their vacations. They get six weeks of paid vacation per year plus 12 National holidays, and everyone gets an additional month's salary in December, as if there is a 13th month, because, well, December is expensive, and as they say in Italy, "What good is a vacation if you can't afford it? If they are married, the Italians get 15 paid days for their honeymoons and if pregnant, five months of maternity leave. And let's not forget those two hour lunches! Moore also interviewed the owners of Ducati and asked: "Do you mind paying your employees for this much time off?" No, because vacations relieve stress and no one is ever sick. And they acknowledge that they still make plenty of money. When Moore shared with the Italian people he interviewed how little paid vacation Americans get, they couldn't believe it. Oh, and the Italians live four years longer than us Americans. Moore traveled to a small village in Normandy where the school cafeteria serves four course lunches that could be found in a four star restaurant. The city and school officials all go over the school menu with a dietician. The kids are served the food while they sit at a table, they all eat family style and are taught good eating habits. There is even a cheese course! When shown pictures of our school lunches, there was shock and dismay...from the kids! Most countries in Europe have free health care and practically free child care and Moore wondered how they could do that. We think it's because they pay way more taxes than we do, but he shows that the French only pay a bit more in taxes than we do but they GET much more and they get an itemized statement that shows them exactly where their taxes are going. What we don't realize is that by the time we pay college tuition, child care expenses and other fees we don't classify as taxes (and that are mostly free in European countries), we are actually "taxed" much more highly than the Europeans. Finnish children are the best educated kids in the world. We rank #29. How did they do it? No homework and short school days. They believe that the brain needs to relax. They also do not use multiple choice exams or teach kids to pass standardized tests. Moore interviewed a Finnish teen who had been an exchange student in the U.S. and the kid said that in America he didn't really learn much. He only learned how to pass those standardized tests. There are also no private schools in Finland. In fact, it's against the law to charge money for education so rich kids don't get a better education than the poorer students. Their college students have no debt. A college education is free - and it's free for Americans, too, if you want to move to Slovenia (not to be confused with Slovakia). If a doctor says you are stressed, your company sends you to a spa for three weeks. It's also against the law to contact an employee when he or she is on vacation or to send a business related email to an employee at home. They stopped the war on drugs and now have no drug problem. Prisoners are treated humanely with nice rooms and amenities. The Norwegians believe it is punishment enough to take away someone's freedom. "No cruel and unusual treatment," an American idea. We have the highest recidivism rate - 80%. Norway only 20%. In 1975 the women of Iceland went on strike to secure equality. Iceland was the first to elect a woman president and other countries have gone on to do so, but not us. So those were some of the ideas Moore got from other countries. But lest you think Michael Moore in un-American for extolling the virtues of other countries (and he does get a bad rap for his movies), he actually reminds us that many of the ideas that these other countries embraced were American ideas. Norway wants "no cruel or unusual punishment" for its inmates. An American idea. Women as equals? Remember the ERA? Benefits for workers? Remember unions? Those countries got their ideas from us. We have just lost our way a bit. The story of Tietou and his family in China from 1953 through the Cultural Revolution and its aftermath. The film starts in Beijing in 1953 with the marriage of Shujuan and Shaolong. They are happily married and loyal Communist Party members when their son Tietou is born. Shaolong is a librarian and Shujuan is a school teacher, but soon, Shaolong is branded a reactionary in a sad and shocking scene. At a library meeting he goes to the toilet and when he returns he finds that he has been banned for some seemingly innocent criticism. So what does that tell you? Don't go to the toilet during a meeting! He is sent to a labor camp and this changes everything for the family. Over the next 15 years Tietou is witness to the effects of party policy on various members of his family as people report each other for the smallest infractions. 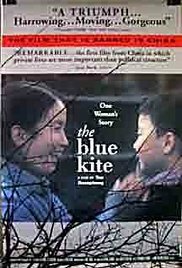 and only the blue kite, given to him by his father, stands as a symbol of hope and freedom. Why it's a Must See: [This film] offers a sublime and often subtle look at how history and politics disrupt ordinary lives...One comes away from this film with a profound sense of how individuals strive to maintain a sense of ethics within a changing society that periodically confounds those ethics or makes them irrelevant." This film was banned in China and the director, Zhuangzhuang Tian, was placed under close scrutiny for making this film "without permission." These repressive dictatorship and communist regime movies get me every time. I still haven't gotten over "Dr. Zhivago." Rosy the Reviewer says...get ready to be depressed. I can't even imagine how awful it would be to live under such a repressive regime, but a reminder to be grateful for our freedoms. Who doesn't love grilled cheese sandwiches? 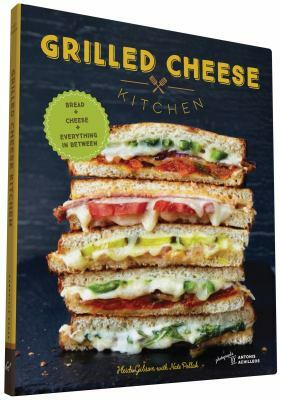 This book has the best grilled cheese and mac and cheese recipes on the planet! I know, I need grilled cheese sandwiches and mac and cheese like I need a hole in the head, but sometimes you just have to give in to your cravings for the comfort food of your childhood. And when you do, this book delivers. I have tried practically every mac and cheese recipe that has come my way, but this book has THE BEST! Of course, it's good. It uses over a pound of cheese! But if you are going to eat mac and cheese, might as well not skimp. As Julia Child used to say, and I am paraphrasing, "Yes, I eat cream and fat but not every day." So when you want mac and cheese go for it - just not every day. Likewise with grilled cheese sandwiches. The recipes in this book are inspired. I want to try them all (but no, Julia, not every day). And the piece de resistance? Mac 'n' Cheese Grilled Cheese! However, here is a little tip about grilled cheese that is not in the book: try baking your grilled cheese sandwiches. Set the oven for 425 degrees and place a cookie sheet in the oven while it's heating up. Prepare your sandwich as per usual buttering both sides of the bread and places the slices butter side down on the baking pan. Bake one side for about 6-8 minutes depending on your oven and how much browning you like on your sandwich. Flip it over and bake for about five more minutes. Mmm. Delicious and crispy and so easy. Rosy the Reviewer says...sometimes it's OK to splurge on what you really crave. If you don't feed those cravings from time to time, you will end up eating far more calories trying to compensate. Trust me, I know! "How To Stay Married Forever"